“Sourdough Crumpets; or, How To Resurrect A Neglected Starter”, read the title, like a treatise for ye olde moderne Housewyfe. Why, I had a neglected starter, and am fond of crumpets. Both addressed in one recipe? Count me in! The first part of the recipe was a fairly standard sourdough refreshment: whisk together, remove some, feed with flour and water. Easy. But the neat thing about this recipe was that the bit of starter that usually gets thrown out gets used instead to make crumpets. Since I cry a little every time I have to throw food away, this seemed right up my alley. You can see the result. Yes, that was intended to be only one single crumpet. To be fair, it may be that my starter was not just neglected, but thoroughly and totally kaput. The refreshment didn’t seem to work at all. (You know, for someone who bakes bread six days a week, I do a terrible job at keeping starters alive.) 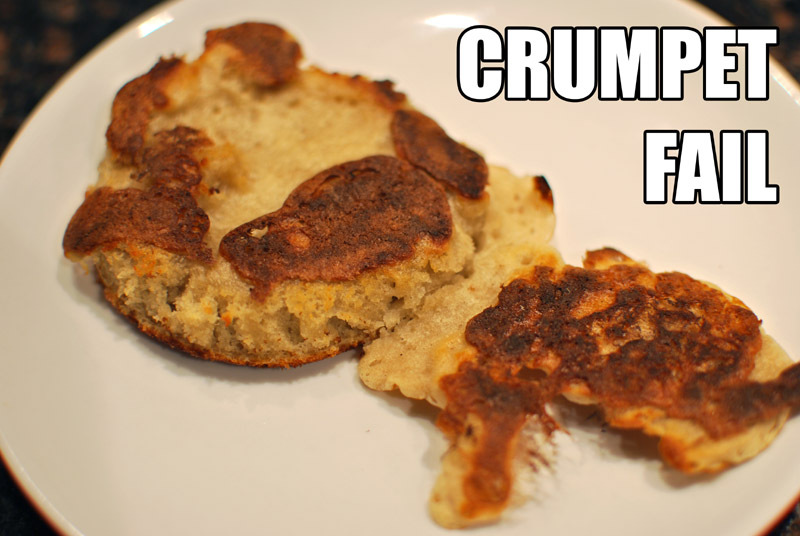 And I would leave it at that, fault squarely on my shoulders, except that the resultant “crumpets” were extremely salty. The doughy, somehow uncooked texture (though they were indeed cooked) was one thing, but I just couldn’t get over the salt. And I’m one who loves salty and doughy things, but I threw these away. I not only consider this a waste of food, but also a sort of personal affront to my culinary skills (of which I feel I may be justly proud). See, if I have to throw food away, food that I cooked, it means that I must admit failure, that it was wholly inedible. If it were simply not up to par, I might chop it up and scramble it with eggs, add it to a stir fry, or mix it into a soup. But to throw something away, immediately after cooking it… quelle horreur. It must be absolutely unsalvageable. Might this have worked with a different starter? Perhaps, but I’ll never know; this recipe has met the same fate as the monstrosities it produced. I know how to refresh a starter (see step 2 here), and if I want crumpets, I already have a fine recipe. If I find myself desperate, they sell them in stores, too. They might not be quite as good as homemade, but anything’s better than these crude beasts. Recipe/method may be found here. I’m sorry, but I just don’t have the heart to post it after such a scathing review. This recipe may work quite well for you; it seemed to for a few people. Me, I don’t think I have the knack for this one.